Hockles and Bunching- All wire-reinforced are subject to hockles, not just ours. Amsteel-reinforced ropes are less prone to hockles. 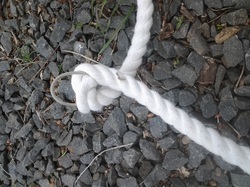 Steel cable core trapeze lines may develop "hockles", where the steel cable protrudes from the 3 strand cotton rope in a small loop. This is not a defect, it happens most often as a result of bending the ropes more than 90 degrees while transporting trapeze between home and studio or gigs. Hockles are easily repaired and should be considered a part of normal periodic maintenance. Over time another maintenance items builds; The cotton strands become 'bunched up' next to the bar (under the elbows) and stretched at the top. 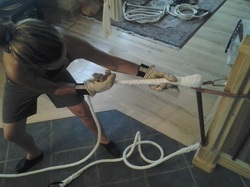 Both hockles and bunching can be repaired by holding the bar in a fixed position and "milking" the cotton cover toward the top of the ropes by repeatedly pulling and sliding the core toward the top connectors (gloves help) until the hockle is buried in the cover and the rope is a consistent diameter along its length. This is time consuming hard work but worth the effort. Your trapeze will have a longer life! If this still does not bury the hockle, you may need to stretch the amsteel or steel cable by mechanical means (such as a come-along) while milking the cover . Another option is to hang the trapeze low to the ground and sit on it to use your weight to stretch the hockle. Once you have fixed the hockle you may want to tape overlapping as you would tape a lyra from the sleeve up over the hockle and past 6 inches and then down again. This will reinforce and help prevent the hockle from reoccurring. Do on both ropes so they match.